Now *that* sounds like a fun fan-film. In TNG "Genesis" an "intron virus" turned Worf into a prehistoric, hairless clawed beast in a few days. It's conceivable some Klingon's may have worked to counteract the Klingon augment virus and further separate themselves themselves from the repulsive smooth heads by returning to more "pure" primordial Klingon roots. That'd work nicely if it weren't for the fact that they view (and have shown) all Klingons to be this way. Indeed, having a sect of anti-human Klingons do that to distance themselves from their weak, human-ified cousins would've been potentially interesting, and could've been used eventually as a path to re-Klingon-ifying the Klingons, enhancing and deepening existing continuity. 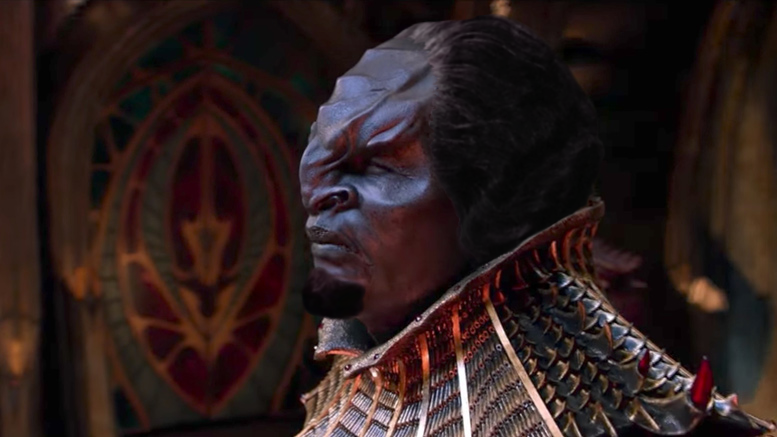 Actually, from what I've read on Memory Alpha, the producers said that the reasons the Klingons look so different here is because the ones we see are the descendants of Klingons who left Qo'noS centuries ago, and have adapted to conditions on some of the harsher worlds of the Empire. Still.... the theory Darth Spock proposed is nearly identical to one I had. The outfits are nice because it at least makes the Klingons more interesting and less of a ridiculous monoculture. Plus it was clearly established that T'Kumva's house is a rogue outlier in terms of how they dress and what they believe. That was a popular fan theory but was never confirmed by producers or stated on screen. Production personnel created a default Klingon for CGI uses with the claws, elongated jagged-ridged skull, et cetera. As for Memory Alpha, the Klingon article says "At the same time, all Klingons shown on Star Trek: Discovery, set within the same aforementioned timeframe, were bald with ridges. The producers, designers and artists have claimed that they have biologically evolved hairless in order to expose sensory pits (like in a "Python"), which allows them to sense prey." That corresponds with my previous reading and contradicts the idea these are Q'onosians of recent vintage. The thing I read was actually both Memory Alpha and some other interview, where a producer said about the Klingons that "they don't all live on Qo'noS, so some would have adaptations to the different worlds they live on", IIRC. So... I was just extrapolating from that comment, and coming up with a hypothesis to make sense of it. That the ancestors of T'Kumva and pals left Qo'noS a hella long time ago, and evolved into a new subspecies of Klingon on whatever planet they landed on. Given that Klingons were established in TNG to have.... redundant synaptic systems, it's possible that these new Klingons' sensory organs were originally caused by mutations in said back-up synaptic systems. The hair helps hide things, yes. My usual list of "quadri-nostrilled be-clawed hairless jagged-ridged elongated-skull botox-lipped double-dicked faux-Klingon" gets shortened by up to two entries (hair, obviously, and the elongated skull if we're feeling generous). Certainly I agree that the costume differences aren't all that relevant. Fashion changes, even among Klingons . . . they could have had a fad of tutus and feather boas in 2258 and it wouldn't represent a continuity challenge*. Having them as preposterously ornate fashionistas for awhile isn't necessarily a bad thing. Klingon women don't have adam's apples. But now we have the Discoprise and Discovery physically connecting, with scale readily demonstrated versus the 700+ meter Discovery. In addition to the reported rescaling from production staff and the EagleMoss info derived from background info, this puts the 2257 Enterprise at around a hundred and fifty meters longer than the 289 from the show, at 442. Either way, the ship is clearly massively rescaled, despite the lifting of Franz Joseph info used in early S2. Needless to say, this nullifies any direct visual connection with TOS or the 305 meter TMP refit. Presumably, if shown, TMP-era stuff would probably also get the comic-book sort of treatment as did the prior visuals from "The Cage" when shown earlier this season. The argument that the ship was merely refit would be on par with seeing a Town & Country minivan, a Town Car limo, and a Town & Country minivan, then arguing they were all the same vehicle, refit back and forth. That may be the backstage info, but the canon onscreen readout tells a very different story as you know already from this thread. Under the picture is a link to the gif of the imagery from the episode showing the relative sizes. That's canon. Ergo, your argument that the self-contradictory readout (which, as you acknowledge, results in multiple sizes for the Discoprise since it doesn't match the Discoprise shape) is supreme must then involve a rescaling (meaning downscaling) of the Discovery itself. What is the correct size for Discovery, if not the official ~750m figure that is, so far as I am aware, largely supported by canon visuals? 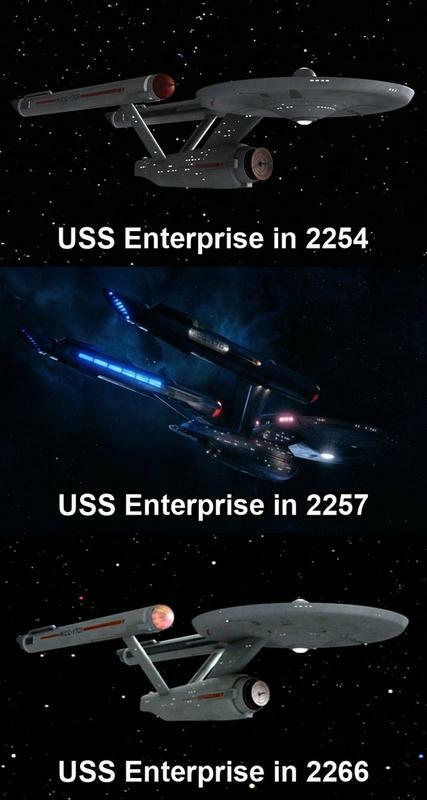 By my calculations, based on screenshots of Discovery and Enterprise next to each other, and the data provided by the computer screen... I'd estimate about 490 meters, or 14 meters longer than the Excelsior. The multiple shots looking into the bridge and five-deck-tall shuttlebay from outside the ship would seem contrary to that. Here's another link to a gif of the ships together, this time with the "evacuation corridors" in place. Looks like ~3.5m deck heights, confirming the ~750m length of the ship again. That requires a Discoprise upscale consistent with the 442m figure. The helm console overlay shows the proportions of the two ships that clearly matches those seen here. which, even assuming 750 m for Discovery, DISC Enterprise is no more than 388 m long. Or 1.933 to 1 ratio. If you go by the canon size information showing on the readout display, Discovery at that proportion is no more than 558 m, most of that spindly super long nacelles. The original test concept design didn't have that and the ship would've been far less than that, like around 400 m with the stubby nacelles. So where does that put us after all is said and done? Unless you want to believe the TOS Jefferies Enterprise was about 400 m long, you wind up with ships far smaller than the official ship numbers for DISC. Ah, good, no video was available to me at the time, just a vast screenshot library seemingly taken every half-second or so. I'll assume that's all you meant by "selective images". The helm console overlay shows the proportions of the two ships that clearly matches those seen here. which, even assuming 750 m for Discovery, DISC Enterprise is no more than 388 m long. The helm graphic doesn't quite match the CGI in scale or positioning. Per tweets from production staffers, they had to make the console part literally months before the CGI work was done and were amazed it matched up as well as it did. Claiming high decks for sets without ceilings is a favorite technique for TOS Constitution re-scalers. It's a popular hobby on TrekBBS to try to make the Constitution up to 450m long by taking the tallest observed deck height and applying it to the whole ship whether or not the windows line up. I consider the maneuver on par with re-scaling the TOS shuttle from 24 feet because the interior set was larger than the exterior . . . it's taking a necessary production cheat and trying to override everything else from it. The deck height I'm pointing out is not from interior sets, but the CGI of the ship, where the windows all line up nicely from bridge to keel. Per info provided early on from the producers, the ship has 17 decks, but it visibly has 18 deck-worths of height . . . the very bottom deck-height (at the keel) has no windows, though, confirming the 17. At the deck-height shown, the behind-the-scenes info of 750m is confirmed, despite any insurgent rescaling efforts.